Susan Harrison grew up in eastern Washington State and has lived in Whatcom County for 44 years. 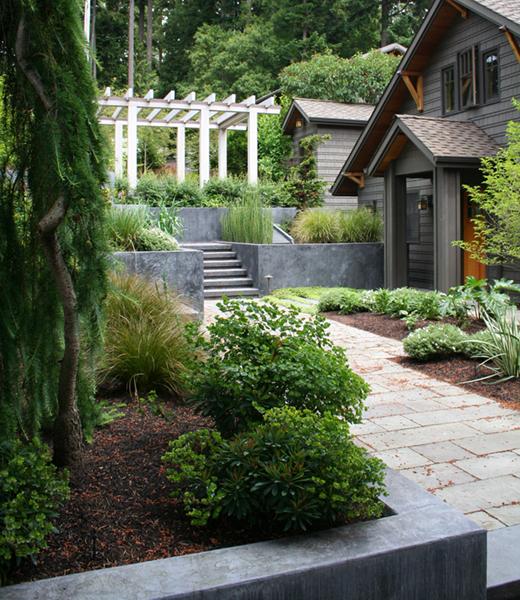 Private Gardens Design, Inc., is a landscape design-and-build company she started 25 years ago that continues to serve property owners in the northwest corner of the state. 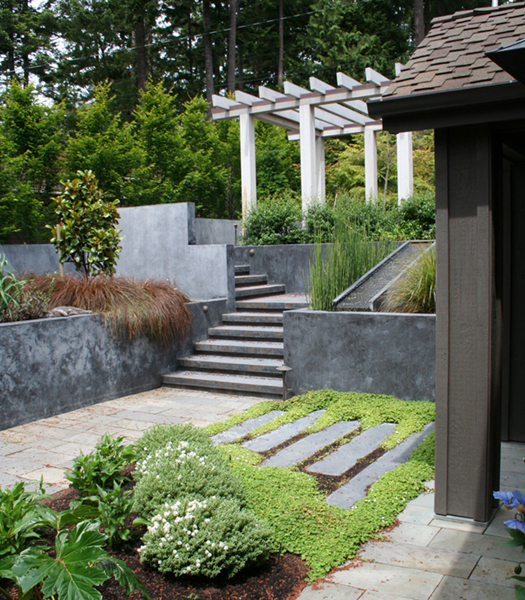 The company was voted first place again this year in the "Best Landscape Design" category in Bellingham Alive Magazine's "Best of the Northwest" competition. 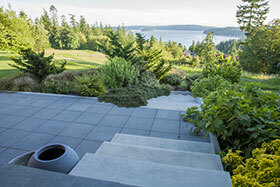 This is the latest in a long string of awards, accolades and magazine features, including: designation as one of the Northwest's "Top 40 Landscape Designers" (Northwest Home + Garden magazine); a "Masters of Design Award" from Pool & Spa News; and a section in Perspectives on Design – Pacific Northwest – a book featuring prominent artisans of the region. While winding down a career in medicine, Susan began designing landscapes professionally in 1990. 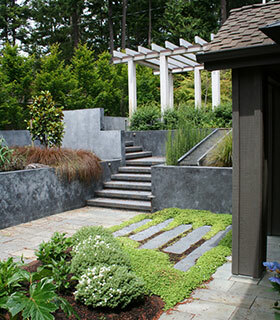 She became APLD-certified in 1999, becoming one of the chapter founders six months later, and was part of the chapter's winning team at the 2000 Northwest Flower and Garden Show. In the first years of her practice, she quickly saw the value in closely controlling construction of her designs and developed a team of professional builders to serve her clients. This tight-knit company infrastructure, paired with a select group of carefully vetted subcontractors, means the resulting landscapes are infused with design intent. No one ever has to ask, "Why did you hire a designer?" It's obvious. 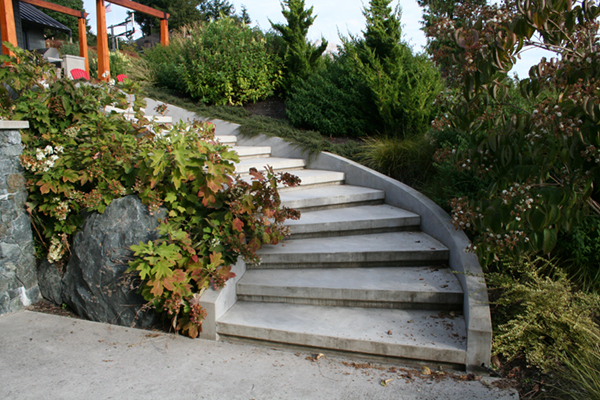 Looking up the stairs that rise from the cottage to the pergola & kayak shed. The main courtyard garden that links the cottage with the house. Susan is always looking at what is going on in related fields such as architecture, interior design, environmental technologies, art and a number of other design fields. "It is increasingly important to have an understanding of multi-national and multi-ethnic traditions and trends, and I am constantly looking at new and old ideas in things like clothing, food, transportation and other areas people don't usually associate with landscape design," she says. 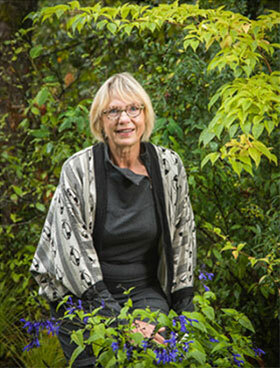 She has traveled to China twice, including leading a delegation of landscape architects and designers in 2001, and has studied Japanese landscape traditions extensively. "Asian design has long influenced gardens in North America," she says, "but often without any understanding of the underlying principles." 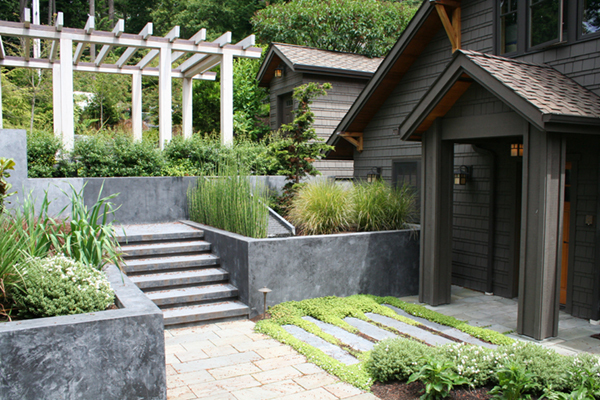 "Landscape design is both an art and a science," Susan says, "balancing what is aesthetically pleasing with the practical demands of your site, lifestyle and budget. Our ability to foresee the finished garden in plan form is a key part of what makes us unique in our market, as well as finding and incorporating an original element of style in each property and for each client. The washboard rill & Equisetum hymale. Long view to the cottage & pergola. Stairs to the pergola seen from near the house. 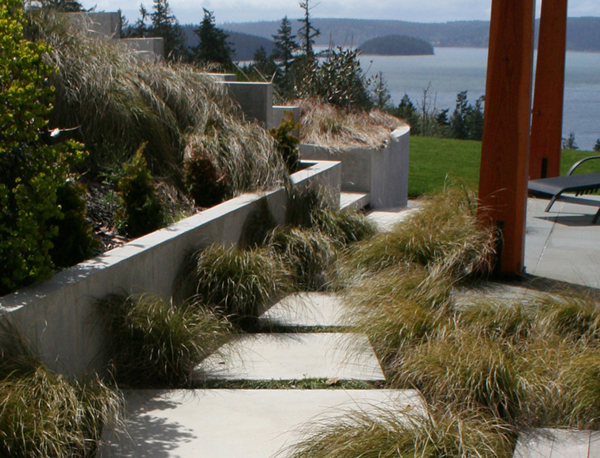 Location: Anacortes, Washington Landscape Design: Private Gardens Design, Inc. Site Description: The property is located on north Skagit Bay about one half mile east of Deception Pass in Skagit County. The property, approximately 1 acre in size, extends from the high-water mark rock outcrops along the shore to the upland area near the road--75' wide and 400' deep. It slopes at an average grade of 20%. Vegetation is dominated by second growth Douglas Fir and Pacific Madrone. Undergrowth consists of salal, wild rose and sparse serviceberry. The property is covered by the state Shoreline Management Act, and is under the technical requirements of the Skagit County Critical Areas Ordinance. It should be noted that this area is considered a Shoreline of Statewide Significance. Soils: Shallow rocky clay on bedrock. 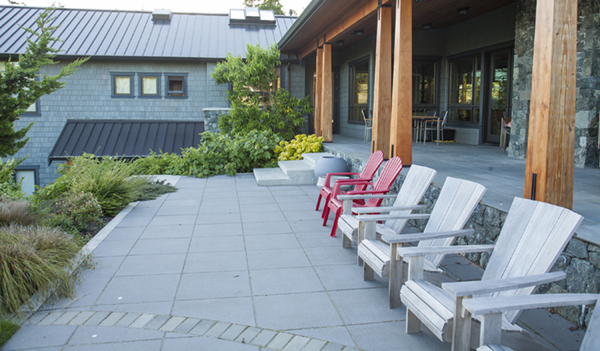 Program: The clients were hoping to screen their garden spaces from the west neighbor's shared driveway, garages and home in a way that provided functional outdoor rooms. They wanted views from the home’s second floor library inside to the garden terraces. Design: The design investigation focused on the long, narrow lot configuration, with a gravel drive sweeping down to the front door, passing three other thresholds along the way. With the reconstruction of the house and other buildings complete at the beginning of the landscape design process, the challenge was to organize the approach to the house to accommodate vehicles, people and garden spaces. In addition to four thresholds at four different elevations, the house, cottage, kayak shed and garage were all slightly misaligned with each other, complicating the desired orthogonal layout. A major wall defining the west boundary emerged as the primary organizing element, shielding the garden spaces from the neighbor. A small, constructed woodland makes the transition from the auto court down to the kayak shed, where a pergola creates a lateral balcony overlooking a series of planters and stairs past the cottage to the house. 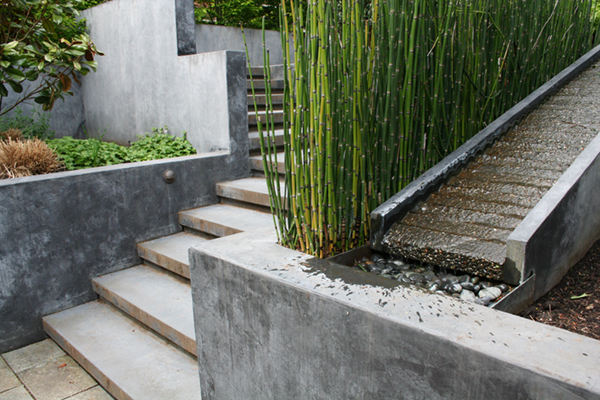 A steep washboard rill flanked with equisetum hymale adds gentle splash to the journey down to the house. 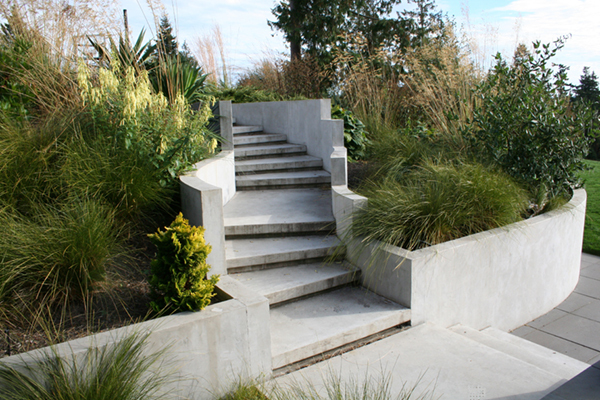 The large knobs of waterside bedrock are connected to the quietness of the uphill woodlands by this series of paths, stairs and planter walls. The landscape designer was involved with all phases of the landscape master planning, planting design, irrigation, lighting design, drainage plan and the personal selection of the plants. The reflecting pool in the Entry Courtyard defines one side of a conversation corner near the front door. A gently swerving stair accesses the sport court from the house. Around the corner from the East Garden, large concrete slabs lead out to the sport court staircase, infinity lawn and the view of the bay and islands. Carex and Mondo grass in paving interstices. Curves in the retaining wall and a band of paving mark the pivot point between the house grid and the infinity lawn. A "sunning terrace" moves relaxation out under the open sky and serves as a departure point for other garden spaces. 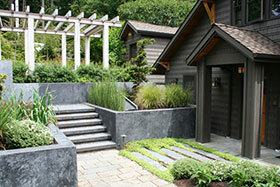 Landscape Design: Private Gardens Design, Inc.
Site description: Suburban lot, 1 acre. 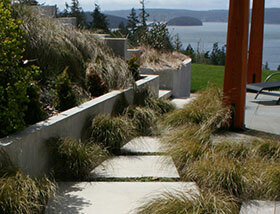 House sits high on a hill with views of Similk Bay and Skagit Island to the southwest. Neighbors are located to the north on an upper hill, looking across the property. 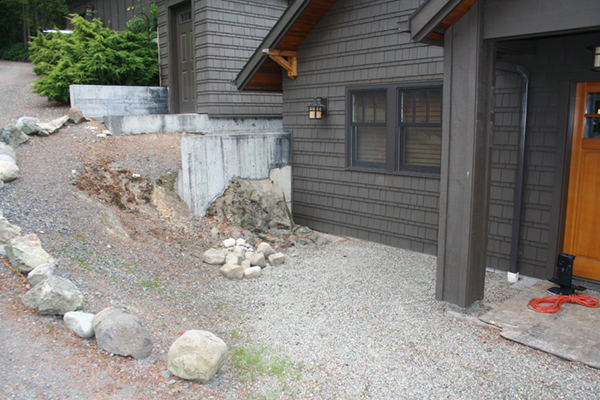 The rear garden backs up to exposed bedrock at the toe of the uphill surrounding slope. Program: The clients requested a comprehensive landscape design. They gave the garden designer great freedom to create a garden that is contemporary with new naturalistic and ecological planting ideas, like coastal prairie plantings. Also, they expressed a desire for multiple areas to entertain family and guests in a unique and modern setting. The plan should include a sport court, a fire feature, screening for septic system components, and an arrival courtyard with water feature. A generous auto court was requested for parking. A small lawn for the children and dog was the only turf required. 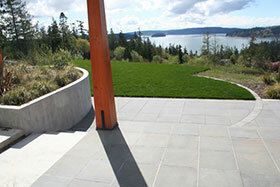 Design: The design attempts to honor the power and beauty of site's spectacular setting: sweeping water views of the San Juan Islands, the effects of the winds and the sunsets. There are a series of outdoor rooms extending the interior layout of the house. 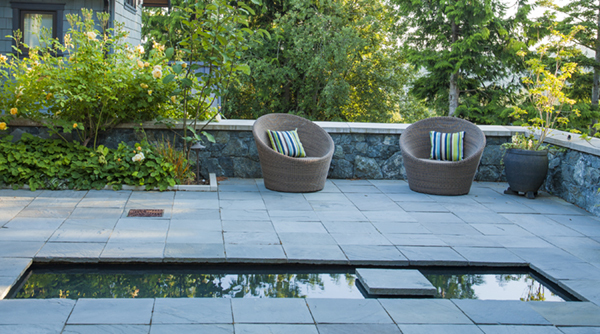 These rooms include an arrival terrace paved in Pennsylvania bluestone with a modern reflecting pool. I saw the water as a slot in a uniform field of paving . . . ultra simplicity. A secluded fire terrace, off the great room at the northeast side of the house, is walled by the stone embankment and can also be entered through a gated ceanothus hedge from the parking area. Curved concrete walls and serpentine staircase lead up to the sport court. A small "infinity" lawn was leveled by a ha-ha. All plantings are on a low-flow irrigation system. 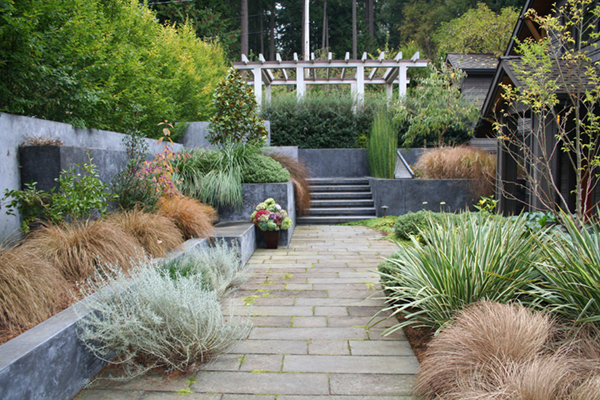 Low-maintenance, drought-tolerant mixed plantings were selected for cuts, fragrance and seasonal interest. 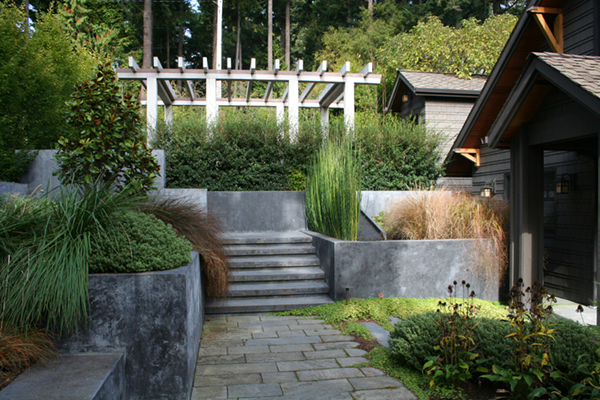 Broad curving retaining walls and stairs lead out into informal spaces as one moves downhill away from the home into a coastal prairie. 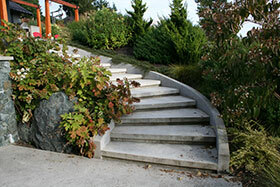 Stairs descend from the Sunning Terrace to the basement entry or into the coastal meadow. View down past the Sunning Terrace to the coastal meadow and out to the bay. Contact Private Gardens Design, Inc.